Nissan Motor, Hewlett Packard Enterprise and Siemens have developed the industry’s first next-generation vehicle design infrastructure that provides Nissan’s global R&D centres with a high-speed connection to the latest vehicle development data. 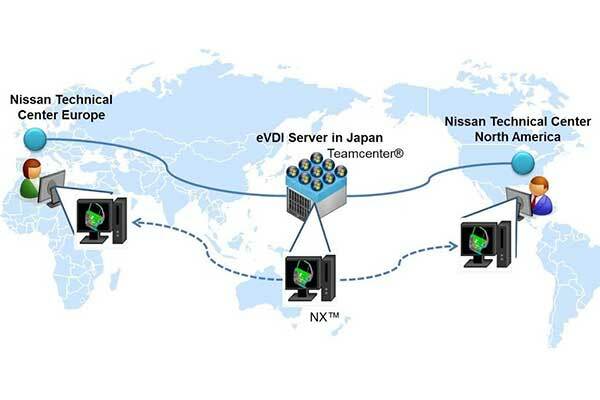 The solution’s engineering virtual desktop infrastructure (VDI) gives Nissan more flexibility and manageability of global vehicle design. Nissan has started to use the infrastructure in North America and Europe. Engineering VDI uses advanced graphics processing based on desktop virtualization technology. It allows engineers to access a virtual 3D CAD workstation on servers and control them on a desktop environment. With this technology, Nissan is able to store the latest data on its servers which teams around the world can access at any time. This will enhance productivity and usability, as well as improve cost efficiencies and disaster risk management, a statement said. This new platform is a fully-scalable, next generation vehicle design solution that adopts engineering VDI globally, utilizing servers with the most advanced graphics processing, high-performance storage, software and network acceleration technology. Nissan will initially use it at two development centres: Nissan Technical Center North America and Nissan Technical Center Europe. With this platform, Nissan expects to experience the same productivity of CAD operations at any global sites, and dramatically decrease costs associated with future system enhancements, version upgrades and operating costs by consolidating and improving infrastructure management. Furthermore, Nissan plans to expand use of the platform in the future, since it has the flexibility to be adopted globally for automobile development. Hewlett Packard Enterprise (HPE) proposed the innovative end-to-end Engineering VDI solution, including the hardware and software, as well as consulting and support services. HPE assembled project teams across Japan, the United States and Europe to deploy, verify and test the solution. This ensured a smooth implementation and ultimately a flexible, fast and reliable system for Nissan.